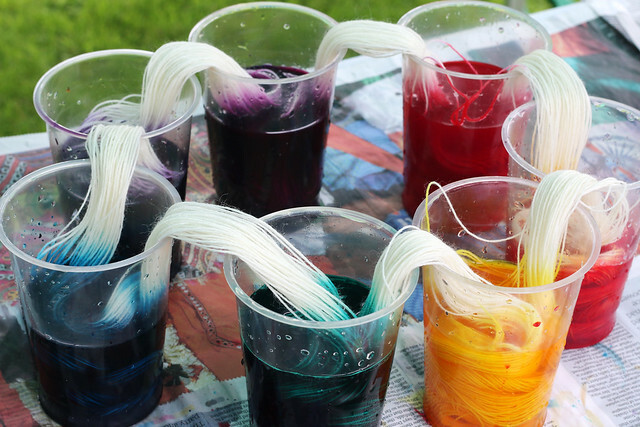 The June meeting of the Birmingham Guild of Weavers, Spinners & Dyers was dedicated to a dyeing day at the home of Guild member Sarah Cage. 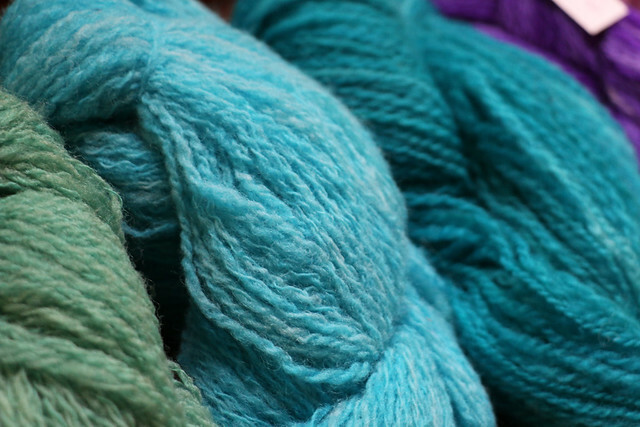 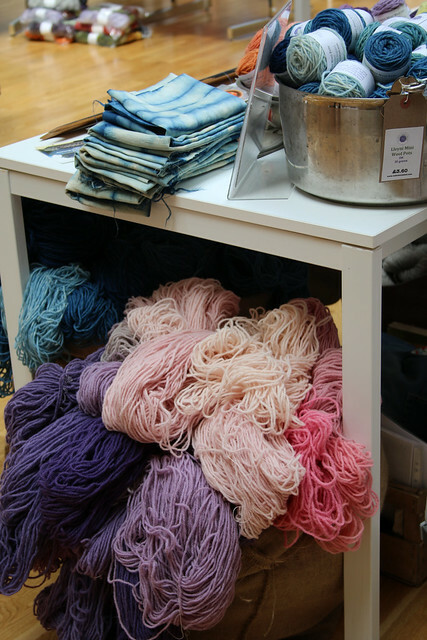 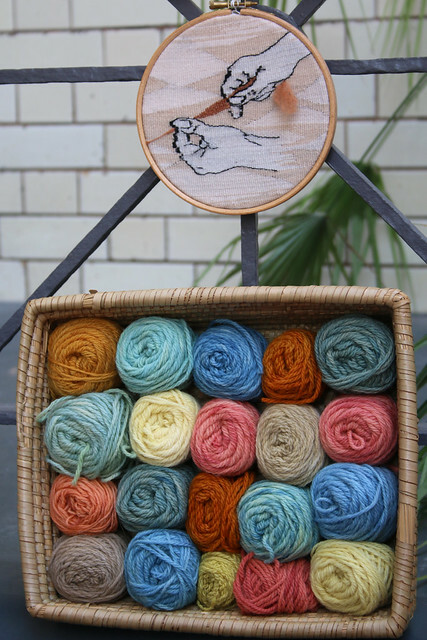 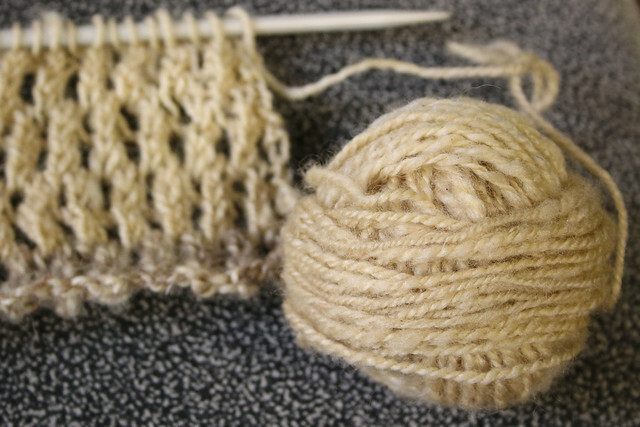 During the day, Guild members and visitors dyed yarn, fibre and fabric with both natural and acid dyes. 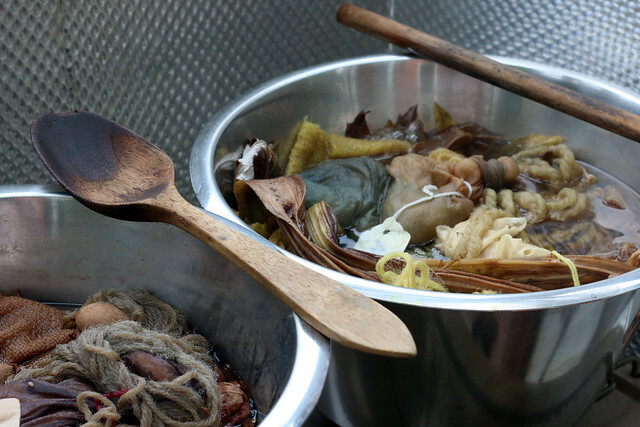 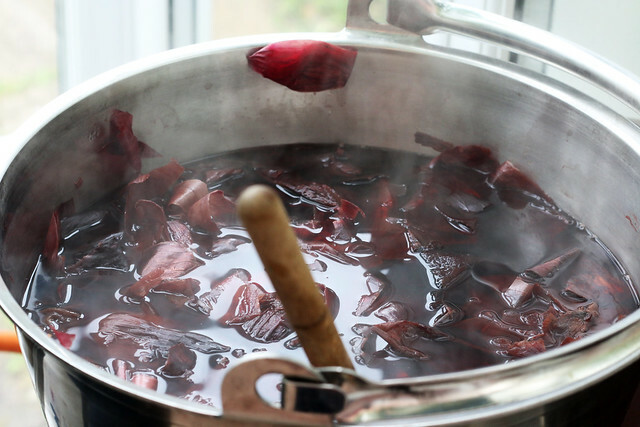 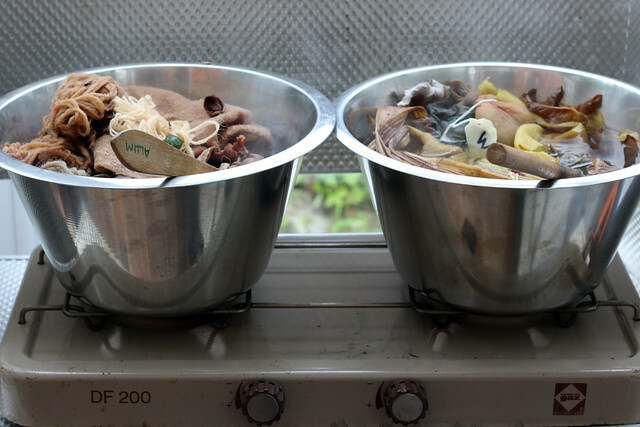 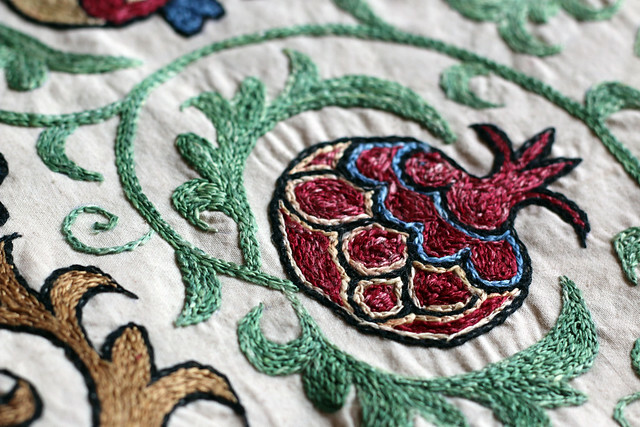 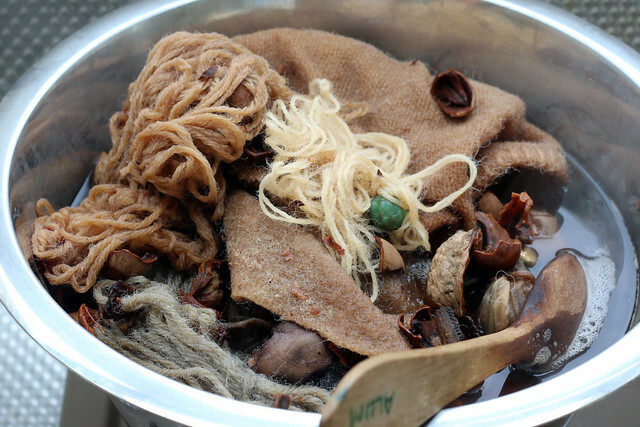 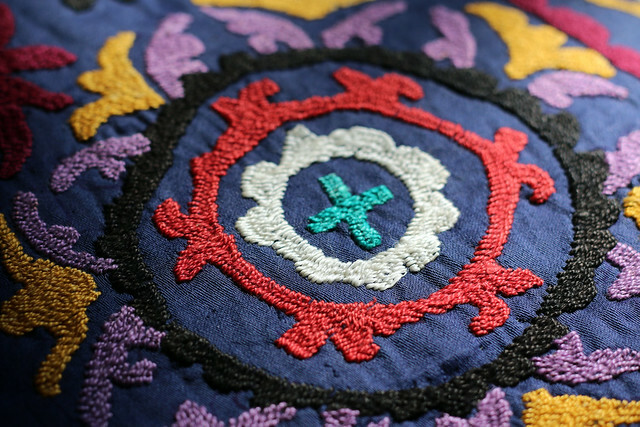 Seven different natural dyes were tested: cochineal (pink/red), logwood (purple/grey), Christmas nut shells (browns), cardoon (yellow), red onion skin (brown), lichen (yellow), and indigo (blue). 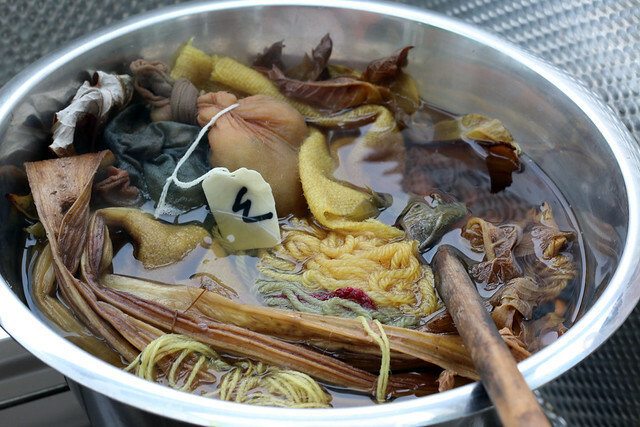 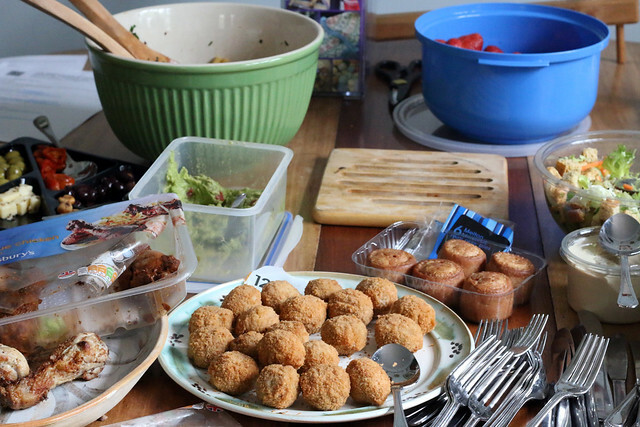 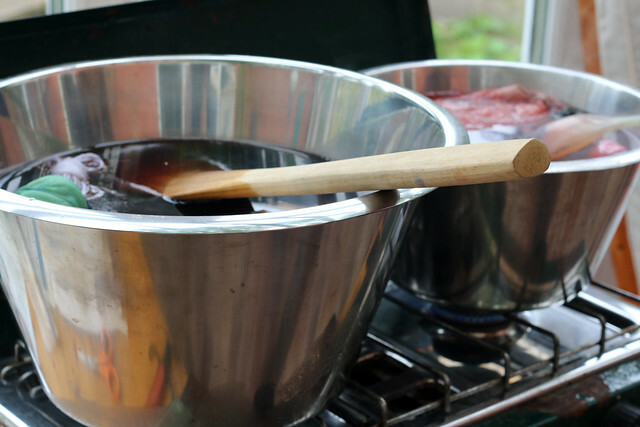 In addition to dyeing, there was plenty of tea, cake and a buffet lunch. 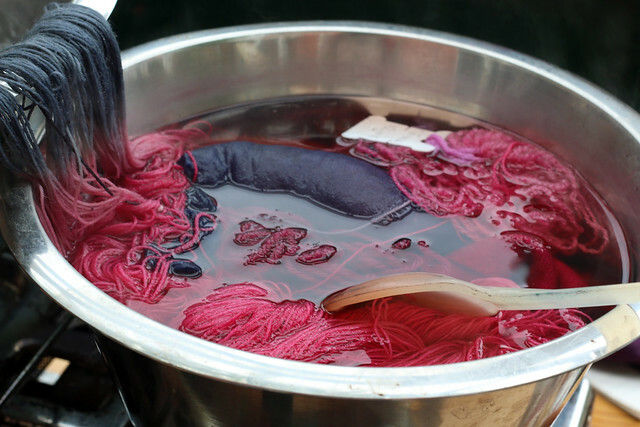 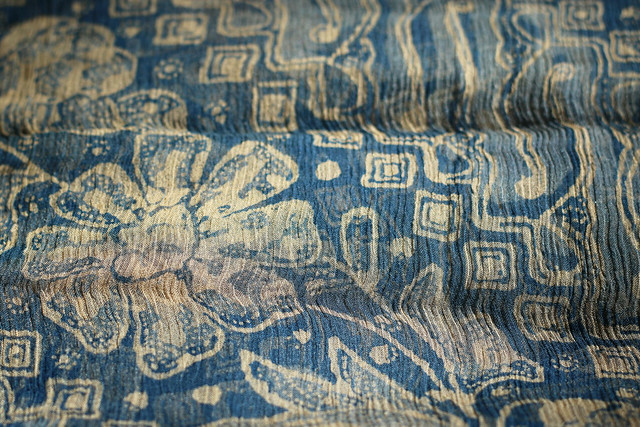 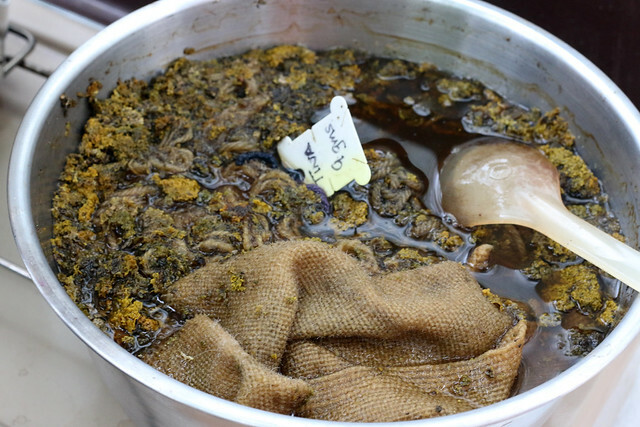 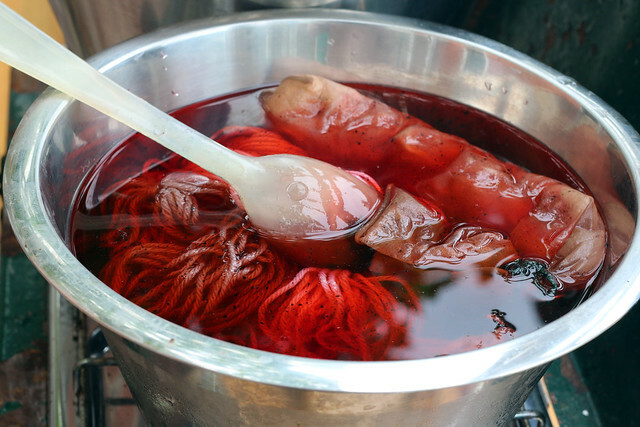 Categories: Dyeing, Natural dyeing | Tags: acid, dye, Dyeing, dyers, guild, natural, spinners, weavers | Permalink. 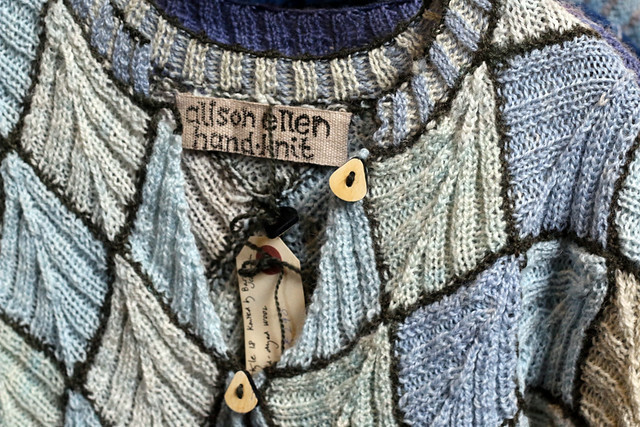 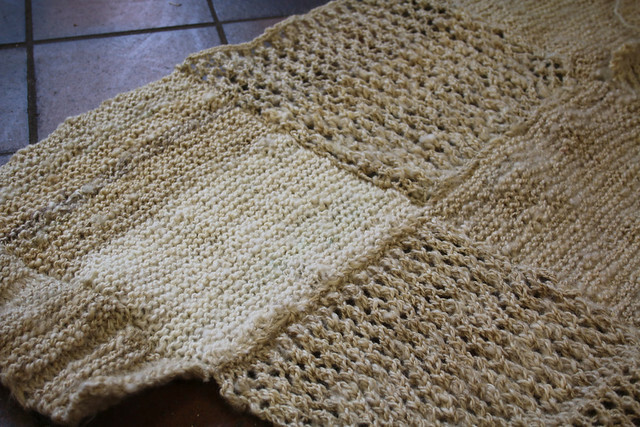 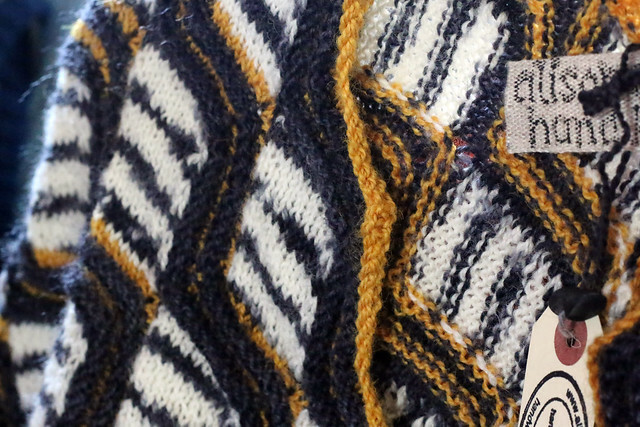 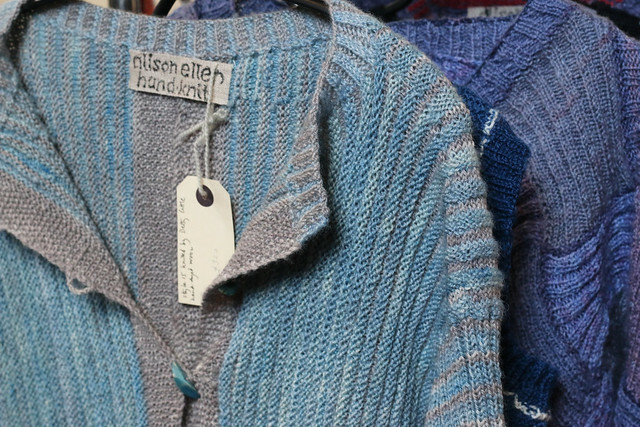 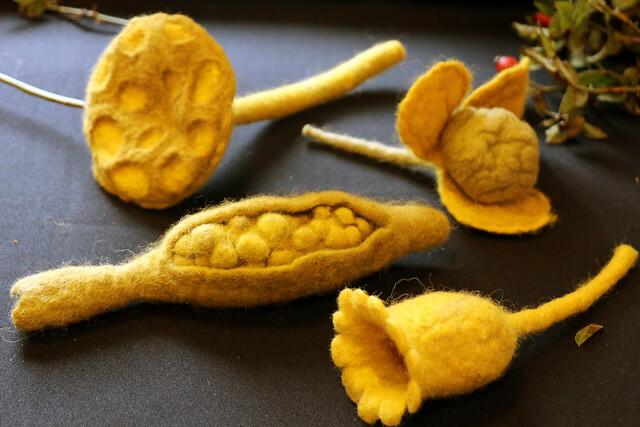 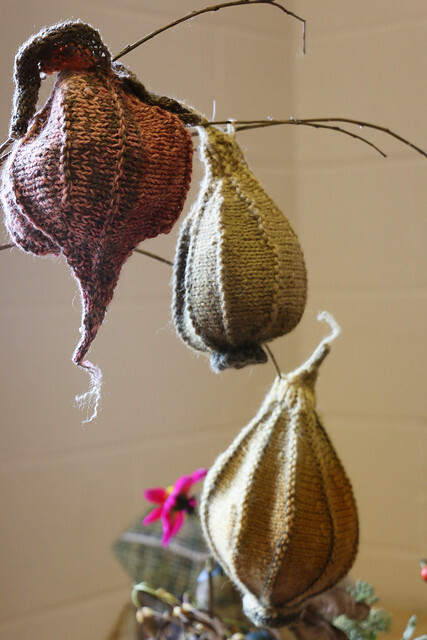 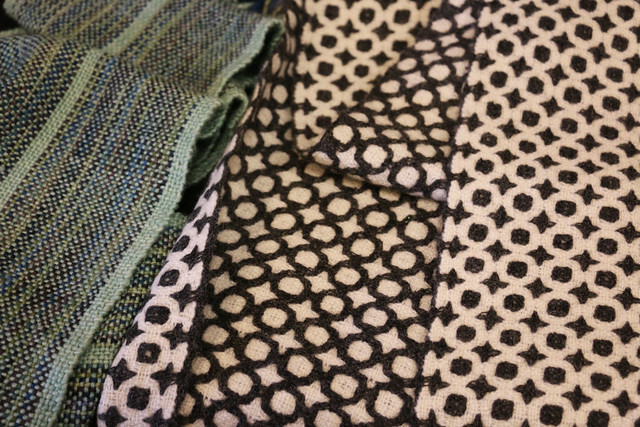 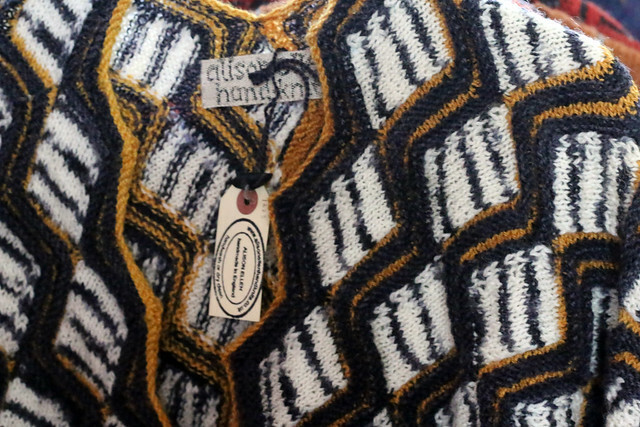 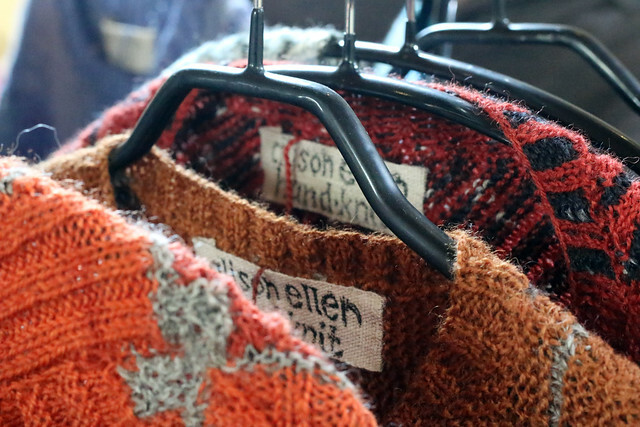 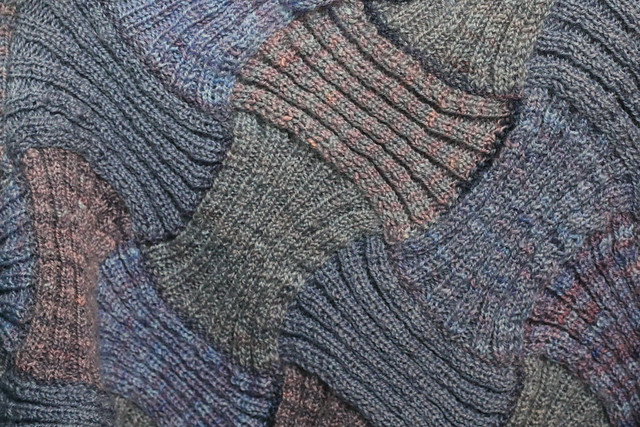 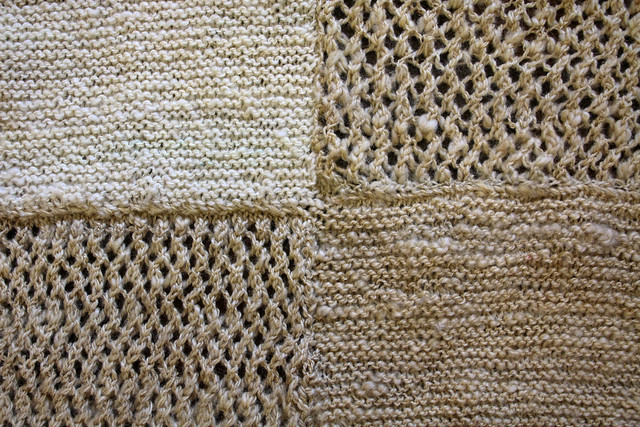 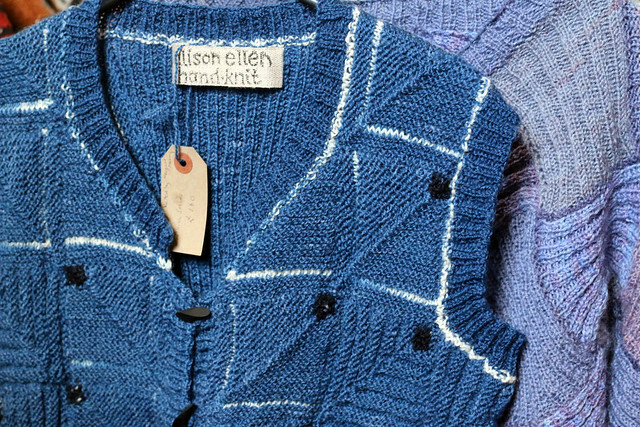 The May meeting of the Birmingham Guild of Weavers, Spinners & Dyers included a talk by textile and knit designer Alison Ellen ‘Stitch-led design: shaping knitting with stitches and knitting in different directions‘. 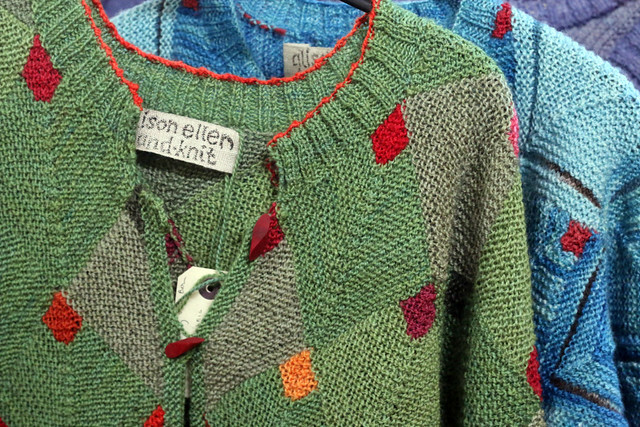 A few examples of Alison’s designs, which were on display at the meeting, are below. 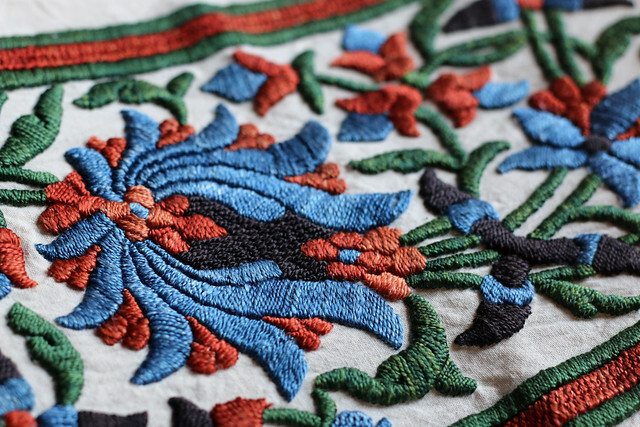 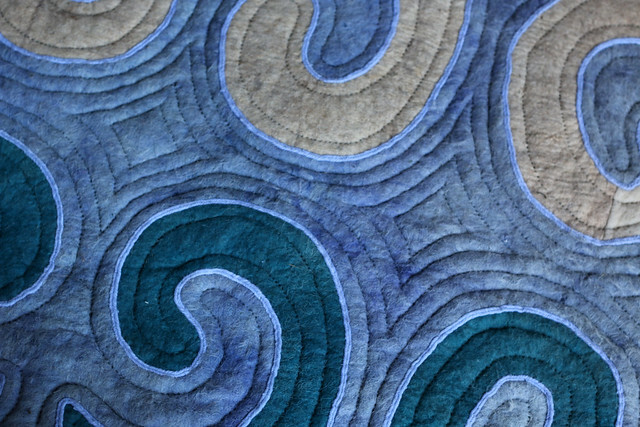 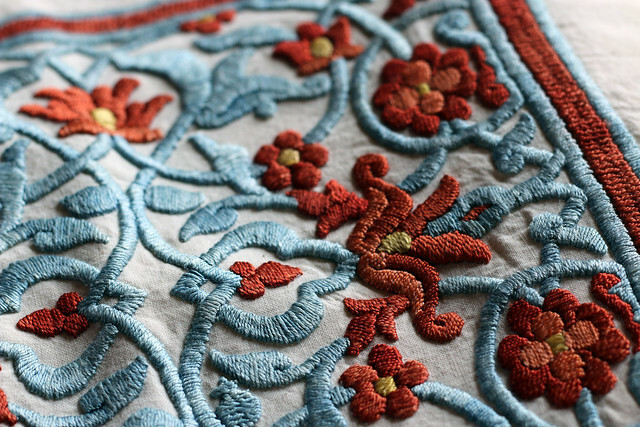 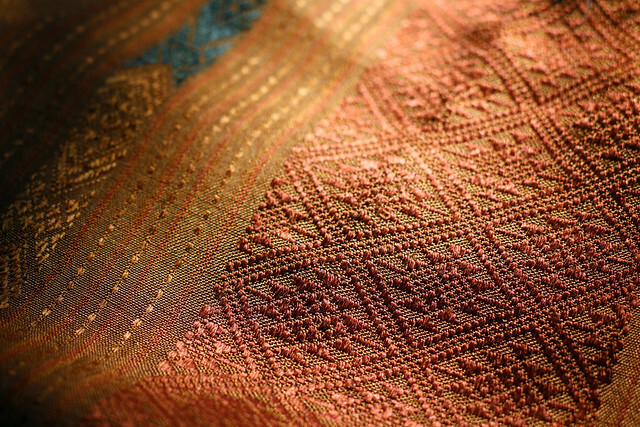 The April meeting of the Birmingham Guild of Weavers, Spinners & Dyers included a talk by Jim Gaffney, ‘Along the Silk Route – from Khiva to Kashgar‘, about the textiles and textile traditions witnessed by Jim and his wife Diane visiting countries along the historic Silk Road route. 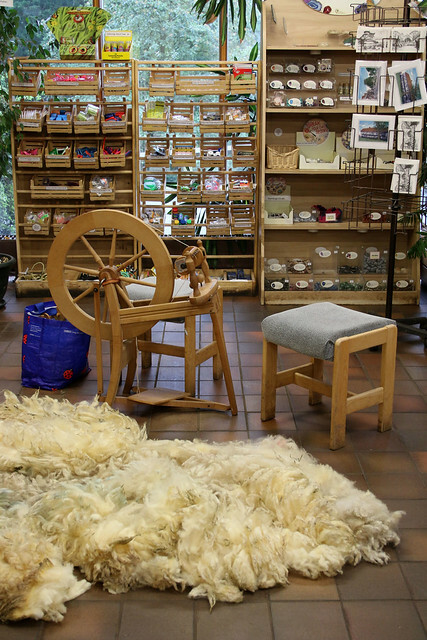 Jim and Diane run Textile Traders, selling textiles online and in their store in Bishop’s Castle, South Shropshire. 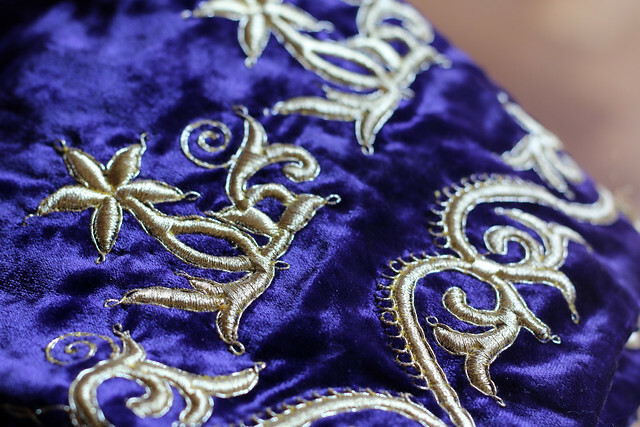 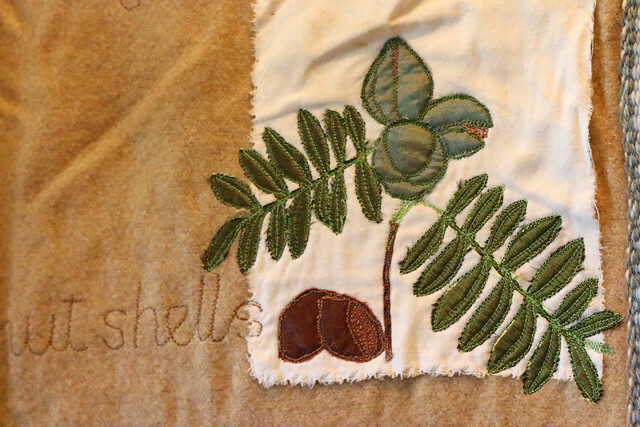 A few examples of textiles Jim displayed during the talk are below. 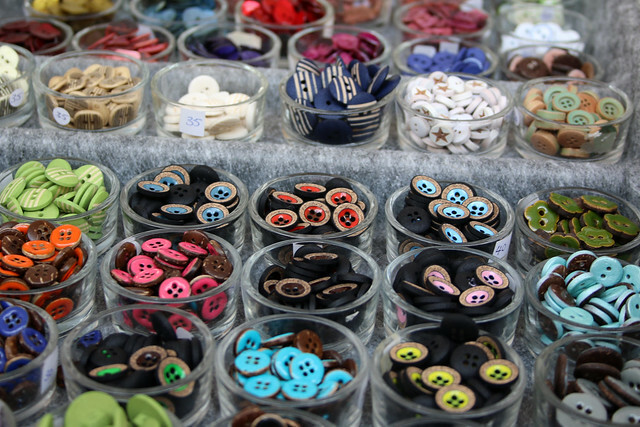 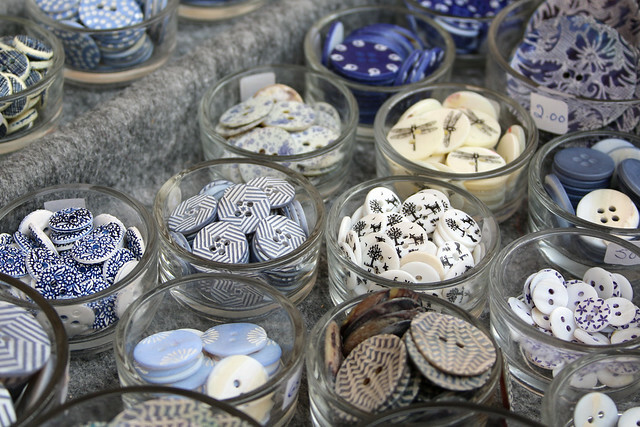 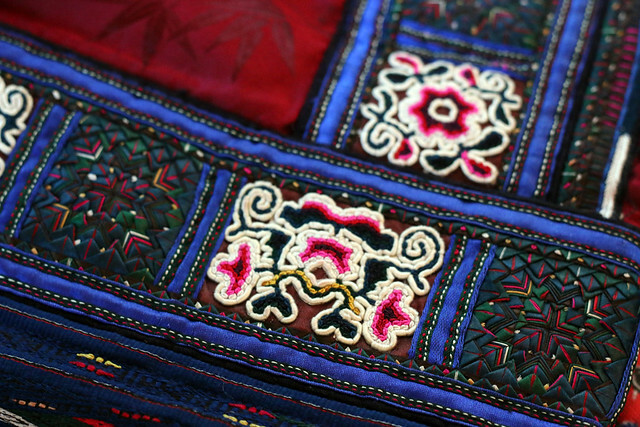 Categories: Talks | Tags: Birmingham, fibre, Kyrgyzstan, silk, silk road, talk, textile, textile traders, Uzbekistan | Permalink. 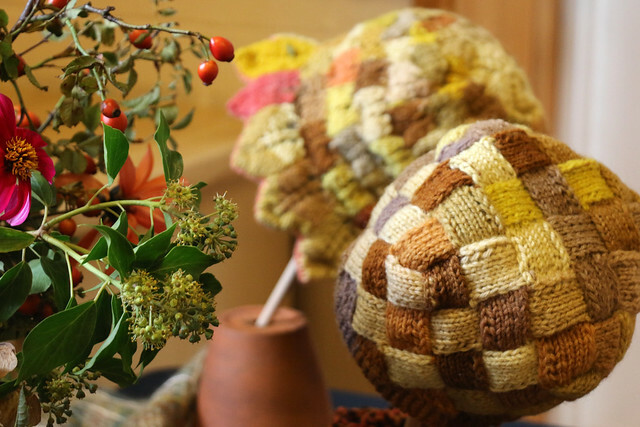 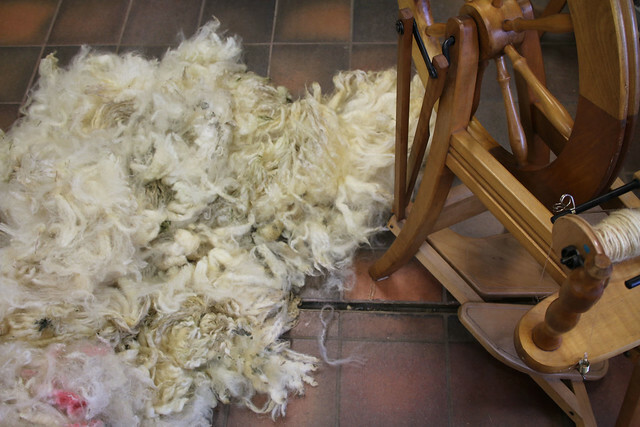 At the October meeting of the Birmingham Guild of Weavers, Spinners & Dyers we were joined by Harcourt Rare Breeds, whose flock are split between Market Bosworth, in the Midlands, and Harrogate, North Yorkshire. 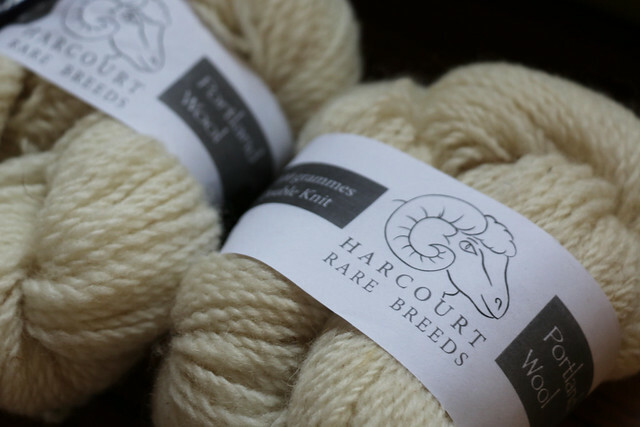 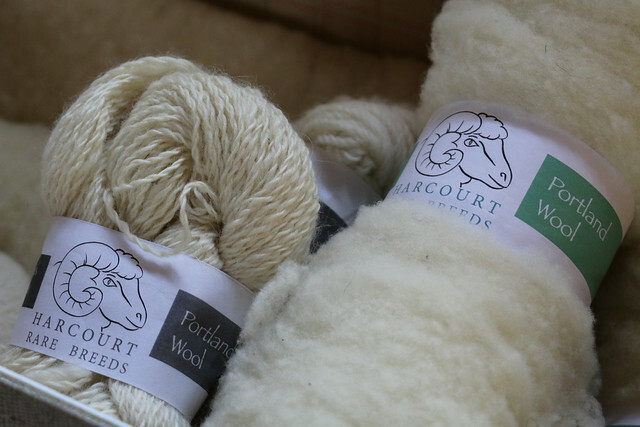 The Harcourt flock of native traditional and rare breed sheep, come from the Portland, Leicester Longwool, Border Leicester Greyface Dartmoor, Hebridean and Coloured Ryeland sheep breeds. 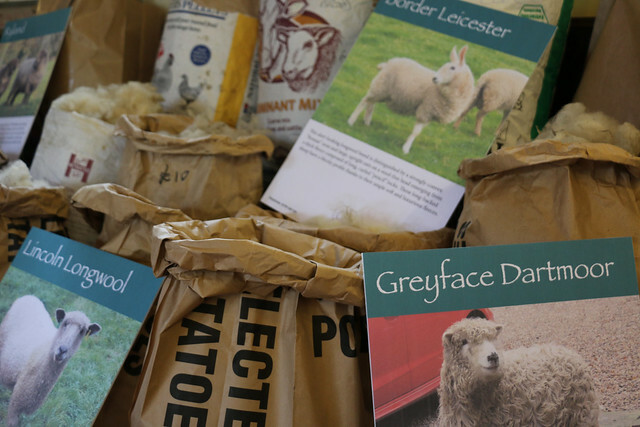 Guild members heard from Shaun of Harcourt Rare Breeds about his flock, and took advantage of the opportunity to buy yarn and fleece. 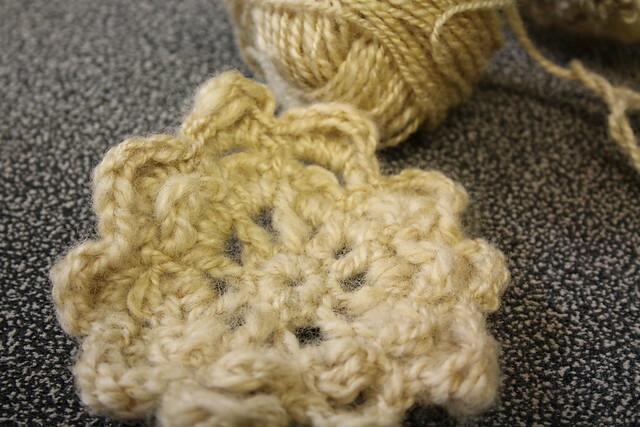 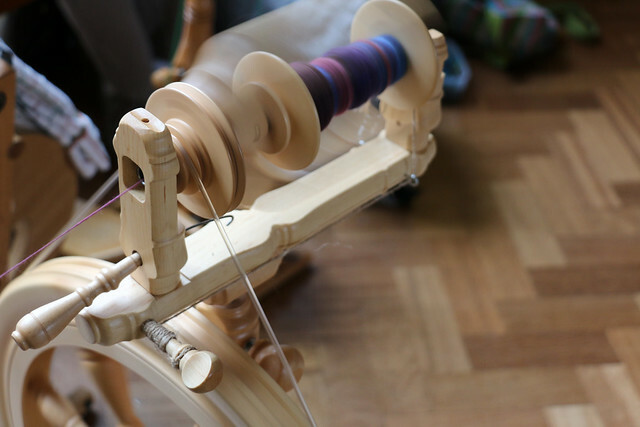 There was also lots of spinning, knitting, and a little lacemaking, taking place. 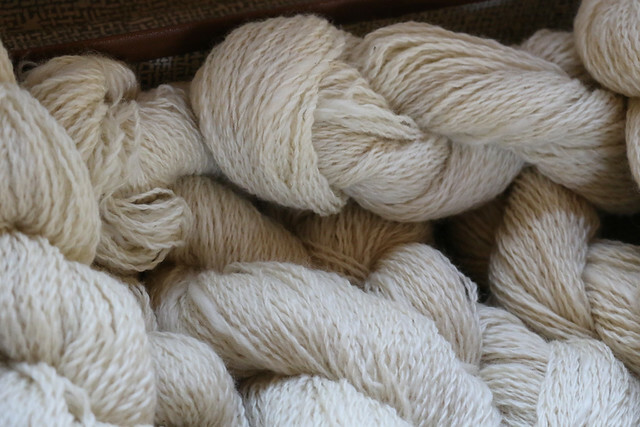 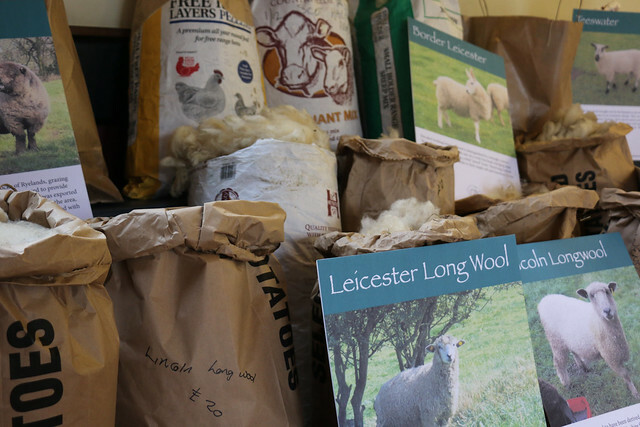 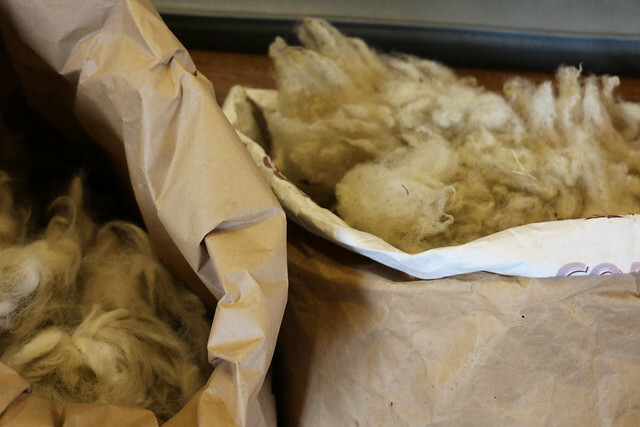 Categories: Sheep, Spinning | Tags: #lovelocalwool, Birmingham, dyers, fleece, guild, Harcourt Rare Breeds, knitbritish, Midlands, spinners, Spinning, weavers, yarn | Permalink. 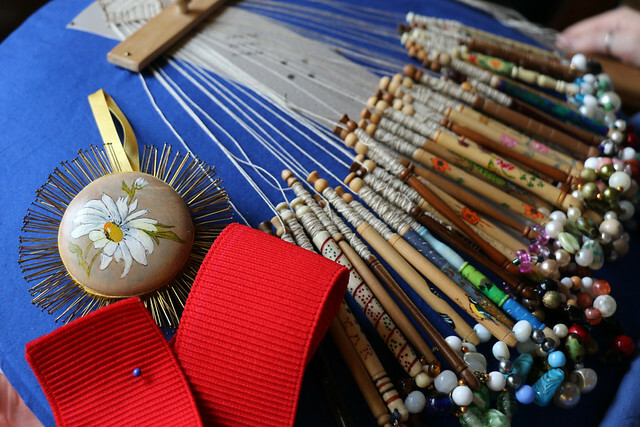 Cotswold, Coventry, Birmingham, Worcester & Stratford Guilds held a Guilds Together event in Kings Sutton, Banbury on 01 October. 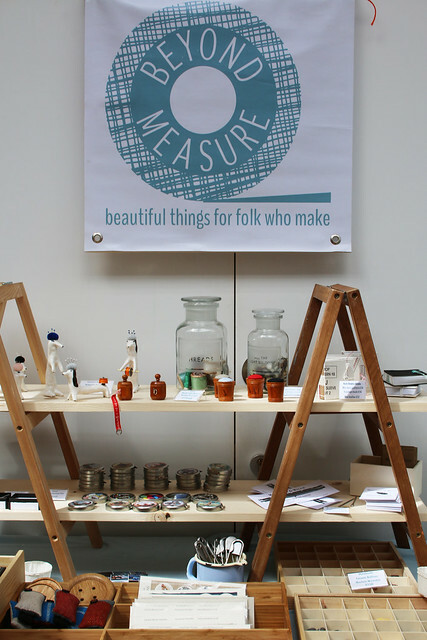 Each of the five Guilds displayed their crafts on an exhibition table on the theme of a season, manned a sales table, and contributed to the organisation of the day. 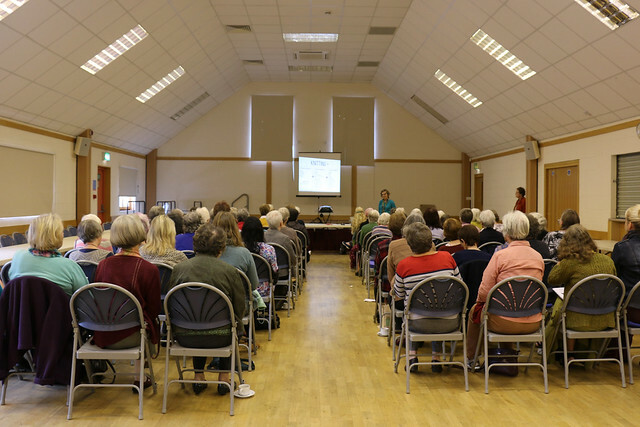 Attendees heard from two speakers. 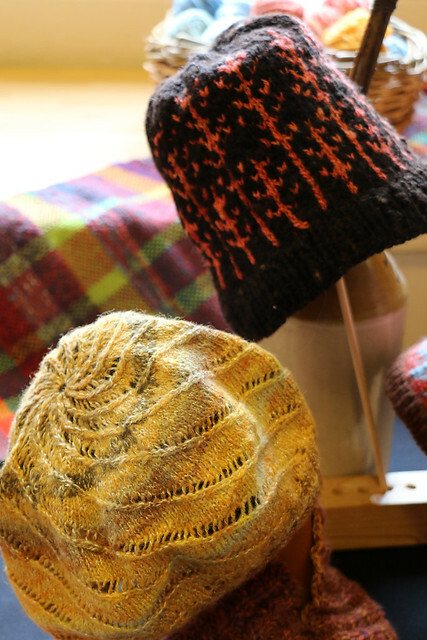 Betsan Corkhill spoke on the therapeutic benefits of knitting and craft. 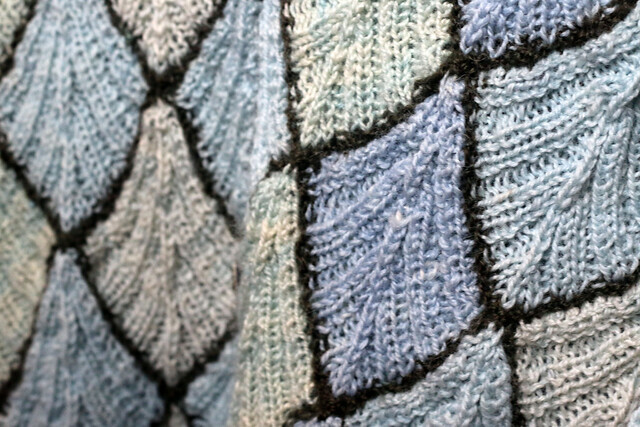 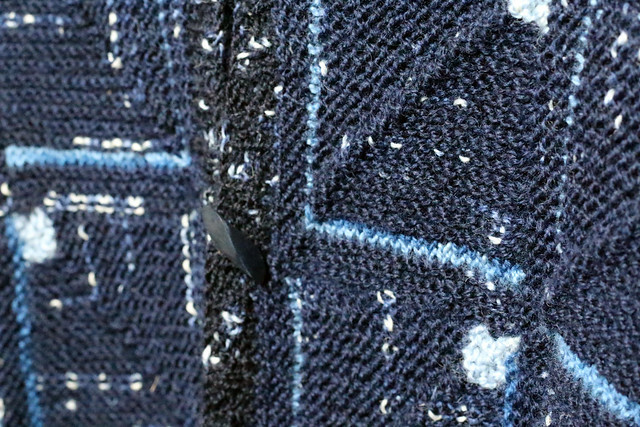 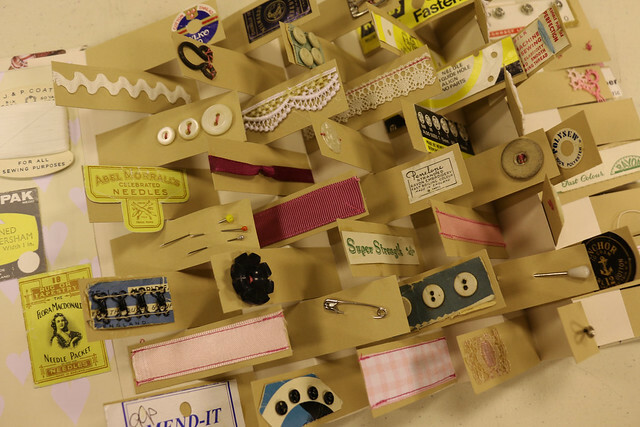 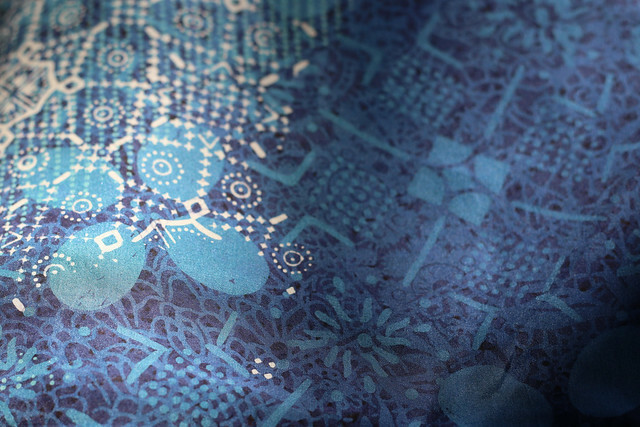 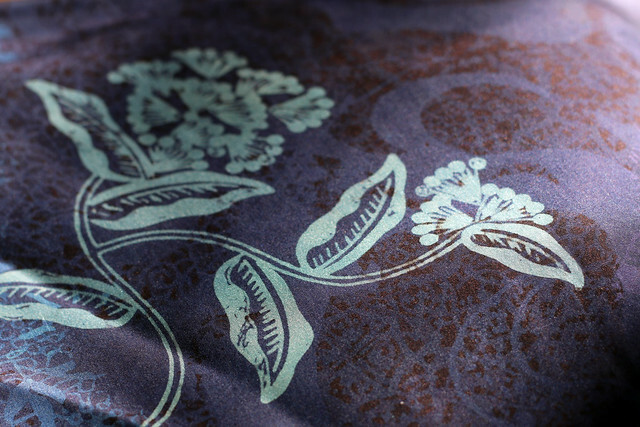 More information is available on Bethan’s Stitchlinks website. 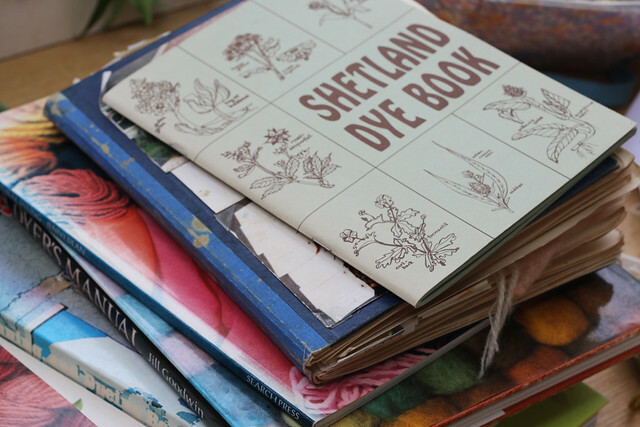 The second speaker, Karen Fanzo, talked about creating art books and exploring new crafts. 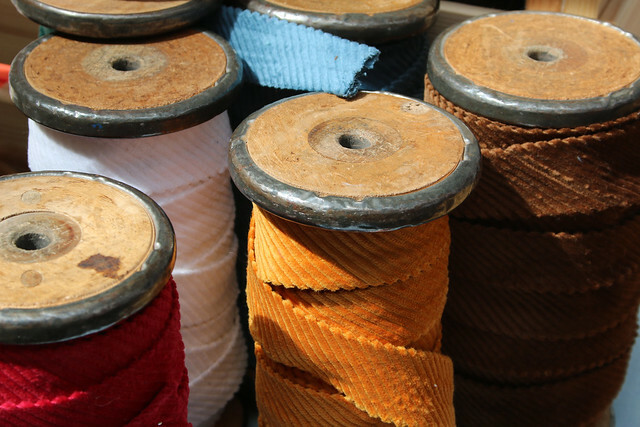 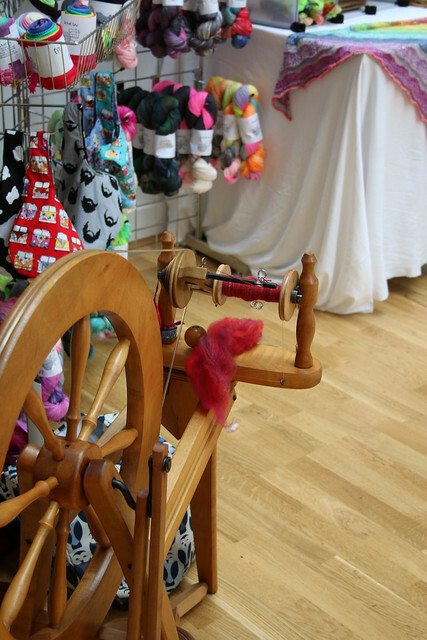 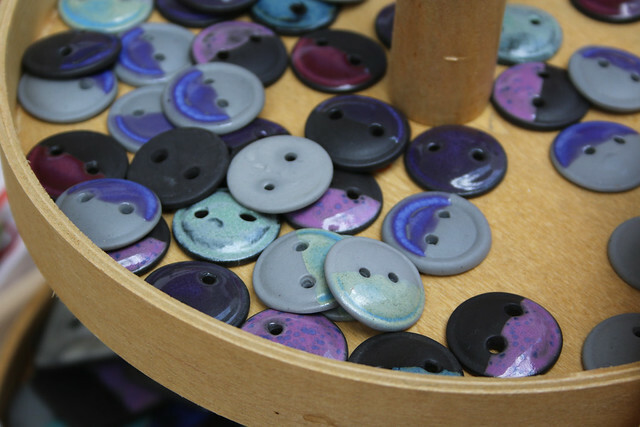 The Birmingham Guild of Weavers, Spinners & Dyers regularly demonstrate locally. 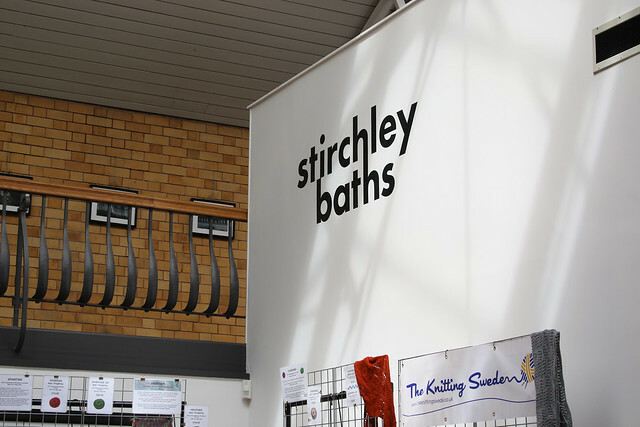 On 16-17 July 2016, The Guild demonstrated at new local yarn festival, Yarningham, produced by Stitches and Hos, at Stirchley Baths. 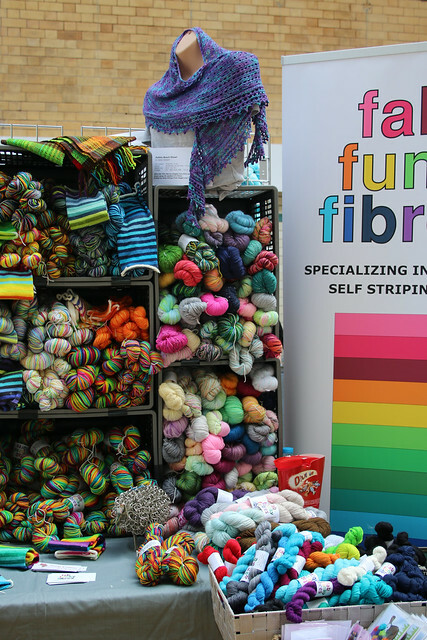 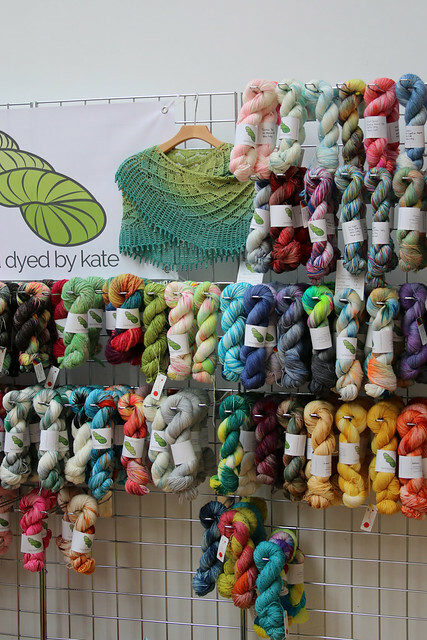 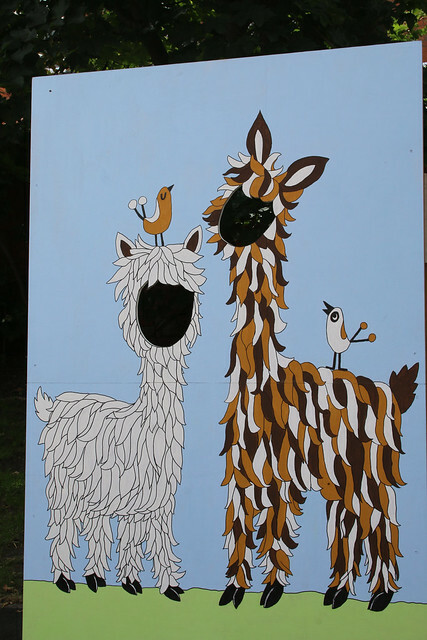 Categories: Demonstrations, Spinning | Tags: Birmingham, festival, Midlands, yarn, yarningham | Permalink. 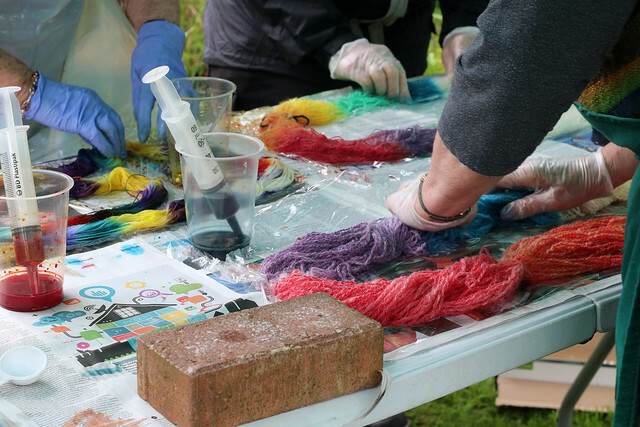 For the June meeting of the Birmingham Guild of Weavers, Spinners & Dyers, we ran a Back-to-Back Challenge at Lickey Hills Visitor Centre. 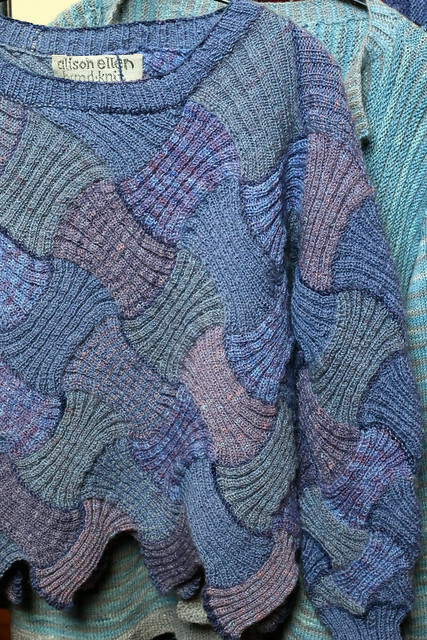 My understanding of the history of the Back to Back Challenge, is that the initial inspiration for the challenge is the Newbury Coat. 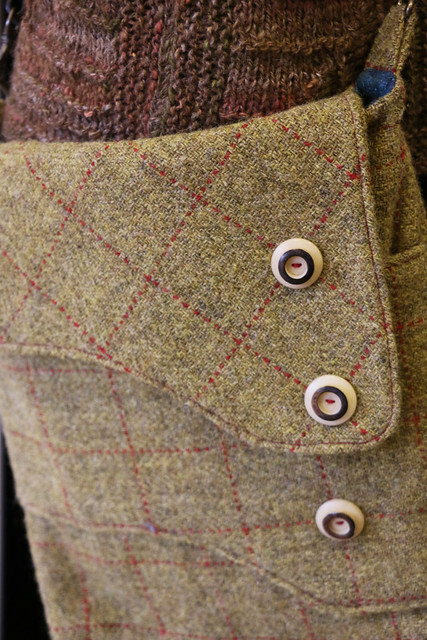 In 1811, in the village of Newbury, a Baronet allegedly made a large bet that a local mill owner could produce a tailored coat in one day. 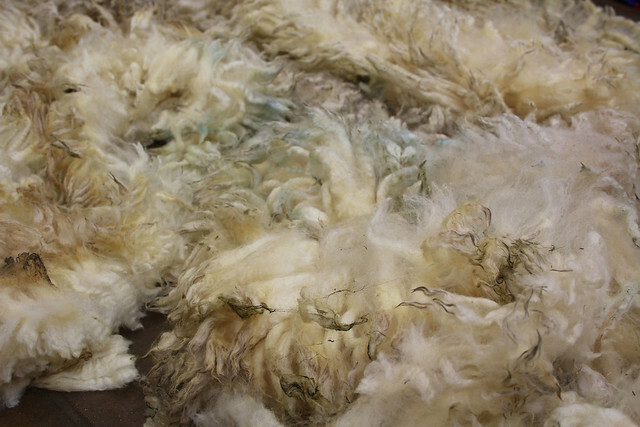 In thirteen hours and ten minutes, those workers involved sheared a sheep, washed, spun and wove the wool into cloth, the cloth was then scoured and dyed, and finally tailors cut and sewed the cloth into a formal hunting coat. 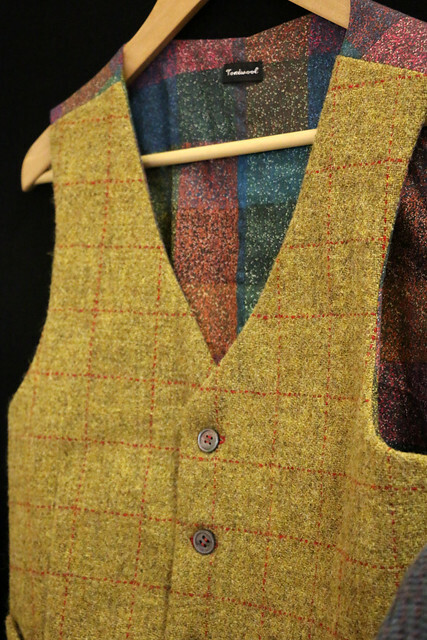 The Baronet sat down to dinner wearing the coat at the end of the day. 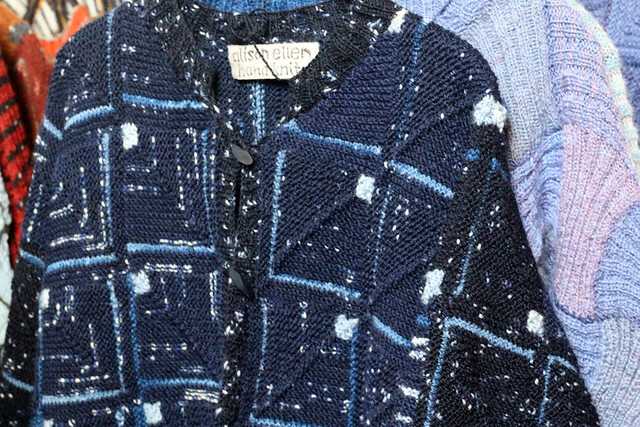 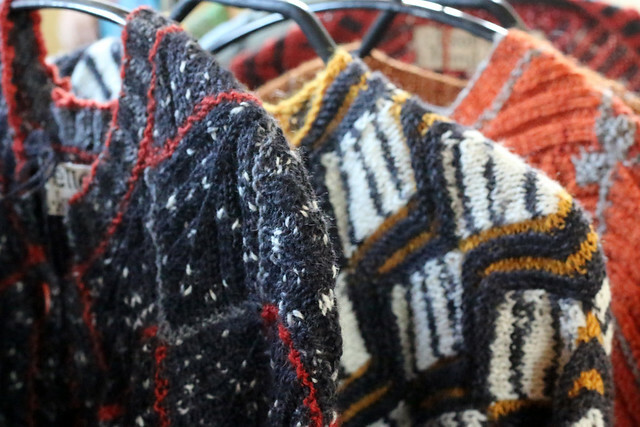 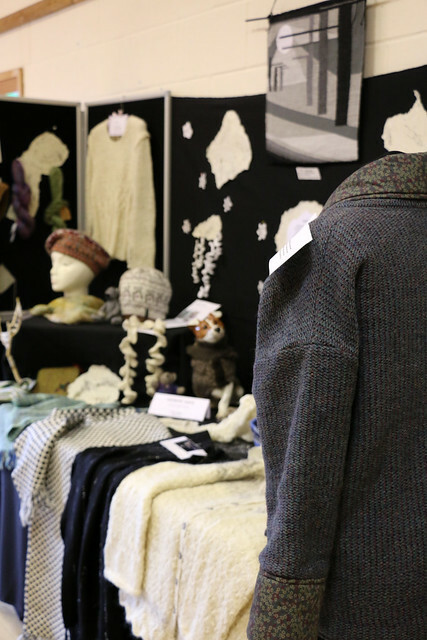 The original Newbury Coat challenge celebrated contemporary developments in mill machinery, but in 1992 the Back to Back Challenge was created to raise funds for charity by producing a hand-knit sweater from a fleece in a day (I believe the World Record is less than 5 hours). 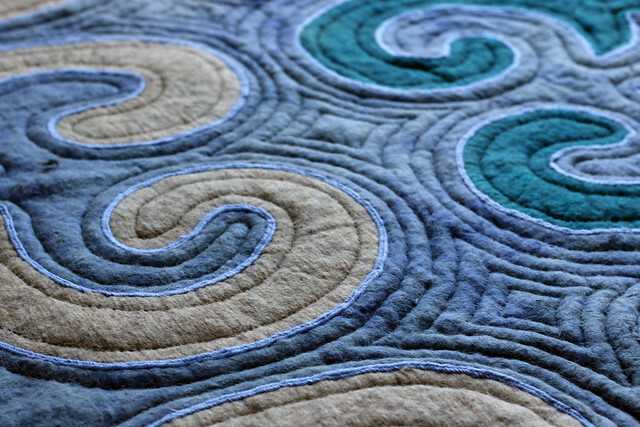 Official Back to Back Challenge entries need to follow set rules, so our Guild Back to Back challenge was more informal. 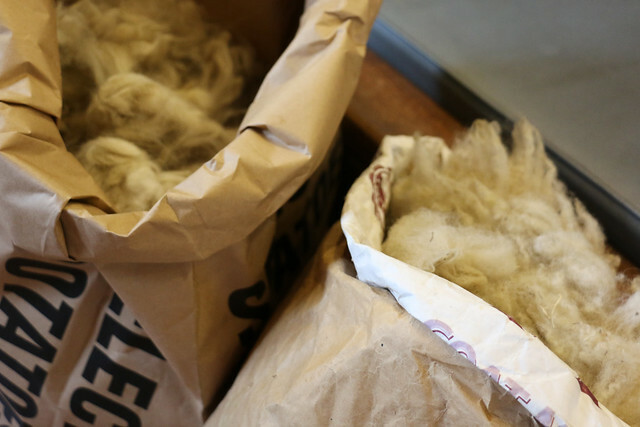 Rather than starting by shearing a sheep, we started with a local Romney fleece, unwashed but pre-sheared. 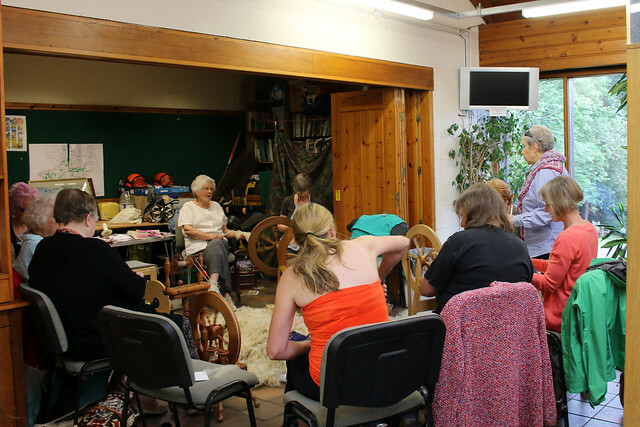 Participation was open to all interested members of the Guild and visitors, with everyone contributing depending on their skills/preference, including carding, spinning, plying, and lots of knitting. 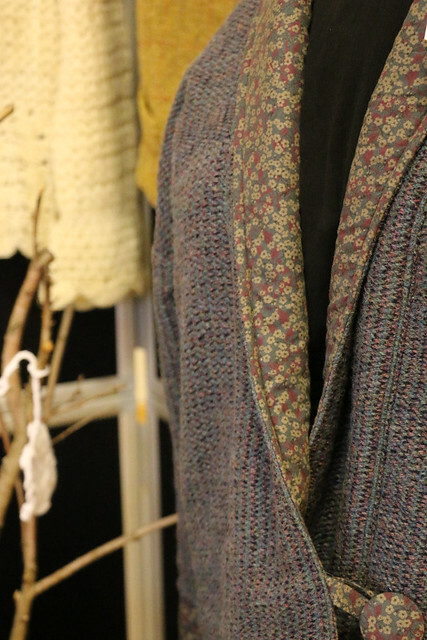 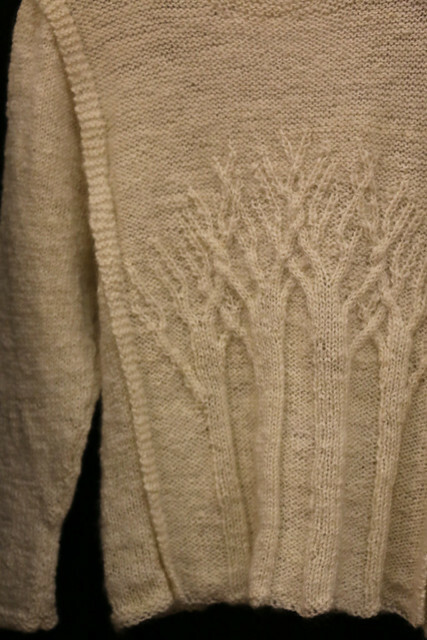 We didn’t quite complete a full garment during the day (our event took place from roughly 09:30-05:15), but we got very close, with just a little knitting and seaming left to do to complete an adult’s oversized cardigan, from a pattern designed by Guild member, Wendy. 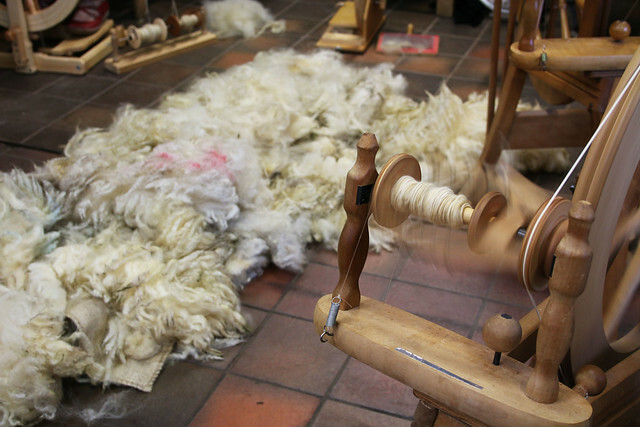 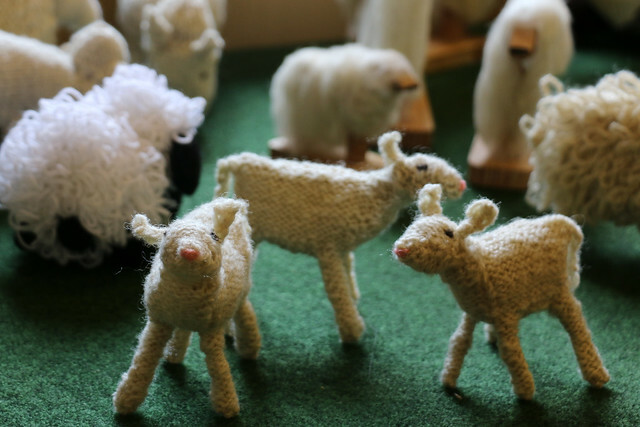 Categories: Demonstrations, Sheep, Spinning | Tags: #lovelocalwool, back to back, British, challenge, fleece, guild, knitting, Lickey Hills, romney, Sheep, spinners, Spinning, wool | Permalink.